and we'll add you to the list. Braveheart is just starting to come out on pay-per-view, well at least in Wichita,Kansas, which is in the United States by the way. Anyhow, I, Felix M. Zacharias, with a possible connection to the Carter clan in Scotland, have seen Braveheart at least seven times or more, I was wondering just how popular is Braveheart in Scotland, please write back. I also think it was the greatest movie. I just watched it last night for 6th or 7th time. Hi, my name is Anthony Burgess. I live in Gainesville, Florida in the United States. I just found your website. I haven't even read the entire first page and I'm already happy that I found it. I have seen the movie Braveheart at least 7 times and still never get tired of watching it. It is wonderful that you have devoted so much time to paying homage to not only the movie, but what the movie stands for also. I would very much love to receive your newsletter and be kept up on any current events or happenings that pertain to this subject. Ever since the movie, I too have become enthralled with William Wallace and the history of Scotland. Thank you again for providing this wonderful website and please keep in touch. Hi! My name is Merle Vahter. I`m from Estonia. I have seen Braveheart 6-7 times. To my mind it`s the BEST movie ever. in response to how many times I've seen Braveheart. regretfully only 6 however this shall soon be remedied for my fiance bought me the movie. I've discovered the MacBH page and would like to nominate myself for a place on the bhtimes page - only a modest 6 times so far, but with the recent video release in the UK I suspect it will be a lot more very soon!! I have seen Braveheart 6 times and have completely enjoyed it as if it was the first time. I have seen the movie 6 times...unbelievable...it NEVER gets boring. My name's Rob, and I'm an avid Renaissance fan. Braveheart was undoubtedly the best Rennie-themed movie ever made. I loved the giant war scenes.. I've seen it 4 times on video, twice in theatre. Oh yes, the reason I love it is William's Claymore, I fight with a sword basically modeled after it at my medieval reenactment group. My name is Carl-Henrik A. MacDougall Barnekow and I´m from Sweden. I´m 17 years old. I have seen Braveheart 6 times (4 times 2 days in a row) and I LOVE THE MOVIE. It´s so good that I can see it so many more times. A funny thing is that I´m related to both Edward Longshanks on the English side and Robert the Bruce on the Scottish side. I will travel to Scottland someday and then I shall stay there for 2 months and visit all the places that has to do with William Wallace, Robert the Bruce and the Scottish war of independence. I think that Braveheart is the best movie ever. It shows how Scotland´s farmers dared to oppose the English king and his tyranny. Thank you sooooo much for this website!!!!!! Seeing it literally brought tears to my eyes! Since seeing Braveheart (I've seen it six times and would gladly watch it again and again! ), I have started to write a book based on beautiful Scotland and it's quest for freedom. It's historical fiction and takes place in 1329 to about1347 or so and is about a young woman, named Shavonne MacKenzie, who takes after William Wallace and Robert the Bruce to free Scotland from the English. Braveheart has become my best resource about Scotland, and I've managed to perfect a Scottish accent, too! I love you people for loving Braveheart as much as I do! Thank you a thousand times over! Hello, hope you are all well. I have seen the film six times now. Three of the viewings were at my Mother's, strangely enough each time the film finished I couldn't help saluting the Scottish Flag which is situated directly opposite my Mother's kitchen window. 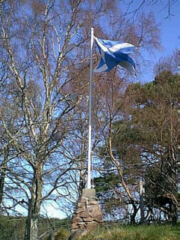 Somebody must have taken time and effort in building the cairn at the base of the flagpole, a perfect job. However, after 2 minutes of saluting the flag, I come to my senses and realise I was born on the wrong side of Hadrian's Wall. I've seen the picture about 5 times, but I just got the video from blockbuster, ah, I forgot, I am from Cancun, Mexico. There are Braveheart's fans in the tropics too! I've experienced Braveheart 5 times. I really enjoyed the movie Braveheart and I have only seen it 5 times. The last time I saw it was Thursday night so my mind is clearly going over all of the favorite lines and facial expressions. One of my favorite is "You dropped your rock." Another is "A child grows in my belly which is not of your bloodline." I just thought that I should share some of my favorite parts of the movie with you. =) Keep up the great work. This is an interesting homepage. My name is Rodrigo Gil. I live in Rio de Janeiro, Brazil. I have seen "Brave Heart" 5 times. Congratulations to your home page. I have seen the movie four or five times, including once on network television. I could have just popped the video in (which I bought as soon as the movie was released on vid in '96) but just couldn't tear myself away from the TV, even with all the commercials. It is truly an amazing movie, and deserved every Academy Award it won. My guess is that it will be revered as Mel Gibson's best performance and direction ever. Freedom!!! David Rogers says : My girlfriend, Erin Abrahams, has seen it four times, but she's just starting. I've seen Braveheart four times. For a Brazilian, with Scottish descendence, there is nothing better for remember this country. We are all SONS OF SCOTLAND!!!!!!!!! I FELL IN LOVE WITH THE MOVIE BRAVEHEART THE FIRST TIME I PLUCKED IT INTO MY VCR. SINCE THEN I HAVE WATCHED IT 3 OTHER TIMES AND IT NEVER FAILS TO MOVE ME EACH TIME. WHEN MY IMAGINATION GETS CARRIED AWAY WITH ME, I CAN SIT AND IMAGINE THAT I'M A "FAIR SCOTTISH LASS" WHOM THE NOBLE WILLIAM WALLACE FALLS IN LOVE WITH AT FIRST SITE. IT'S CRAZY, I KNOW BUT EVER SINCE I WATCHED IT I'VE FELL IN LOVE WITH THE SCOTTISH WAYS. ONE DAY I PLAN TO GO TO SCOTLAND TO VISIT. I OWE ALL MY ROMANTIC NOTIONS ABOUT SCOTLAND TO THE MOVIE BRAVEHEART. MEL GIBSON, EAT YOUR HEART OUT! My name is Danitza Huerta, please include me in the many viewing list, i`ve seen 4 times the movie. Thank you, and congratulations for your page, it`s great. I, Rickey Wallace, have seen the awe-inspiring movie Braveheart four times. And my brother, Randall Wallace has seen it just as many times. Only 3, but more to come. The movie is so powerful I have to take breaks between video viewing. I have a copy of Brave Heart and have seen it three times and will see it a couple of times this summer. My name is Marion Putman Keranen of North Dakota. I have a Wallace ancestor. I have seen Braveheart twice, and I am drawn to the story for the idealism of its main character. I have done research via the internet on the movie and on the man Wallace. The fascination comes from Wallace's determination (which is borne out in the writings about him) and his refusal to negotiate any compromise of his principles. I was not surprised that the movie and the facts differed greatly at times, but the essential character of the man is intact. I also agree that the story of Robert Bruce would make a fine movie. I have seen the movie Braveheart 2 times and I really like it. I think that William Wallace is really cool. I'm Claudio from Torino ( ITALY ); yesterday for the second time I've seen the film "Braveheart", and I thought: I MUST looking for something about SCOTLAND on the web and so I've found your site (it's very OK); excuse me if my english is very poor but I would prefer to speak SCOTTISH ! Just once, unfortunately for me, I wish to own it for I loved the story, but mom doesn't like the "R" rating... ah well, some day. Mel Gibson's best performance.